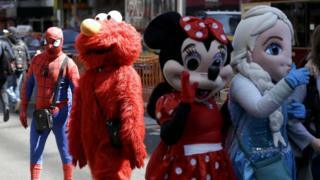 New York City's council is considering legislation to restrict where performers dressed as characters like Elmo and Spiderman can solicit business. The costumed performers now roam freely in Manhattan's busy Times Square, the heart of the theatre district. The council is mulling rules for pedestrian plazas after receiving complaints about aggressive behaviour. Some working in Times Square argue that the rules would inhibit their tips. In August, New York City Mayor Bill de Blasio formed a task force to combat the proliferation of the busking street performers. The panel recommended that street performers be roped off into designated zones. "Come to New York, duke it out with a superhero! Is that really what we want to be known for?" Councilmember Daniel Garodnick said. During the hearing, a man dressed as the comic book villain the Joker, 49-year-old Keith Albahae, said he experienced harassment from tourists, being spit on. "I defended myself by spitting back," he said. "It's not right, this is apartheid, what's being proposed here. We provide an immense entertainment. The only people who are upset basically are people who want free pictures." Abdelamine Elkhezzani, wearing a Spider-Man costume, said he has been arrested four times in Times Square, most recently after allegedly fighting with a tourist over a tip. "It sounds like we're criminals carrying guns and knives," he said. "They are harassing us." In another instance, a man dressed as Cookie Monster attacked a child when his parents did not tip. The legislation would not restrict any activity that goes in in Times Square now but would limit it to specific zones. "We are not saying that all the people dressed in costume behave this way, but there is a consistent and ongoing issue that needs to be dealt with," said Tim Tompkins, president of the Times Square Alliance business group. A union representing those who sells bus tour tickets is not happy with the proposed law either. The president of Transport Workers Union Local 225, John Menshon, said he and his colleagues should not be "penalised for somebody else's aggression". Zones would allow for 50 to 55 people at one time. If the bill passes, it would go into effect by the summer, covering all 53 pedestrian plazas in New York City.